Mount Rainier is the ultimate in American alpine climbing. Outdoor adventurers have plenty to do at this all-seasons destination and mountaineers love this 14,411-foot climb. 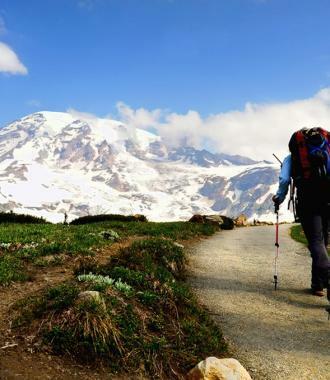 Paradise, on the southwest side of Mount Rainier National Park, keeps climbers busy with more than 16 trail networks. As one of the prime winter-use areas, Paradise Meadows is a snow enthusiast’s utopia where sledding, snowshoeing and cross-country skiing thrive. During the rest of the year, enjoy Paradise for backpacking, fishing, and day tripping. At an elevation of more than 6,400 feet, Sunrise is the highest point that can be reached by vehicle. With acres of wildflower meadows, views of glaciers and spectacular sights, Sunrise is full of magnificent scenery. From the summit you can hike, bike, ski or snowshoe your way back down. On the lower slopes, take a guided snowshoe tour and venture through the playground of snow. This snowy mountain transforms from a winter wonderland to a summer oasis—perfect for year-round recreation. Test your arm with extreme disc golf or saddle up a horse and trot through the wildflowers. 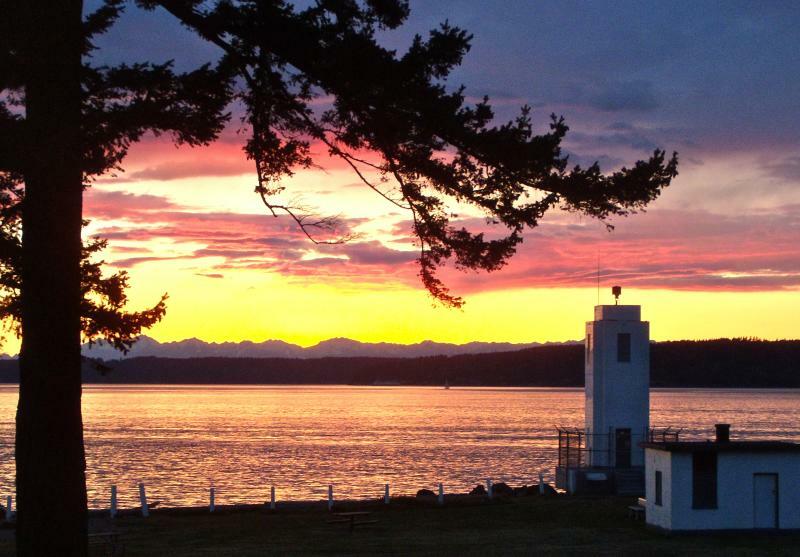 Explore small, countryside communities full of charm on the roads leading to Mount Rainier. With a combination of vintage storefronts, native wildlife, and historic preservation, these communities will leave you with memories for a lifetime. 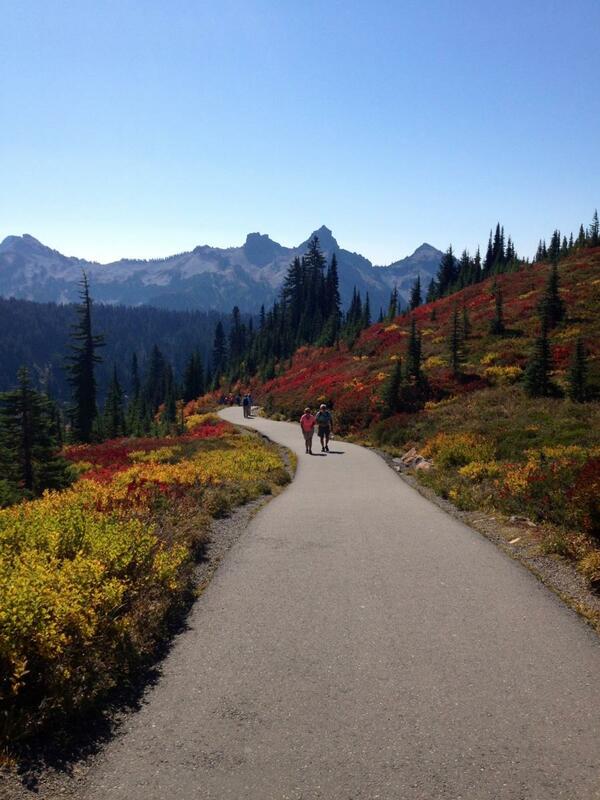 Enjoy Ashford&apos;s extensive trails before you reach Mount Rainier National Park’s Paradise entrance. Buckley is the perfect place to hike, bike or blade the Foothills Trail, a former railroad line. Discover why Orting is called the “small town with big views” and check out the genuine “Old West” flavor Roy has to offer. Shop Wilkeson’s antique stores lining Main Street. Stay overnight in a cabin or inn to complete your mountain experience. Enjoy the waterfront at Elbe. 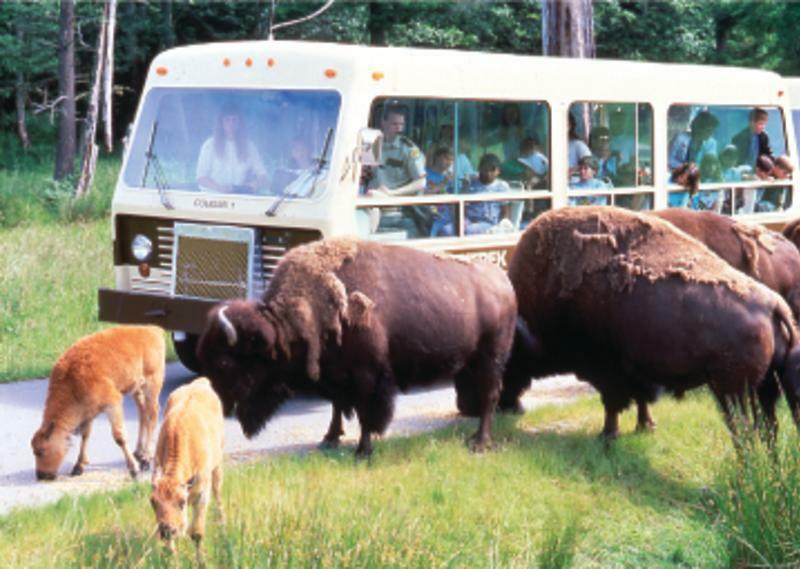 Get up-close and personal to wildlife on a tram ride in Eatonville at Northwest Trek. Step back a century in Elbe with a ride on one of the oldest running locomotives in the country at the Mount Rainier Railroad and Logging Museum. You are in the wilderness, but that doesn&apos;t mean you can&apos;t eat well. 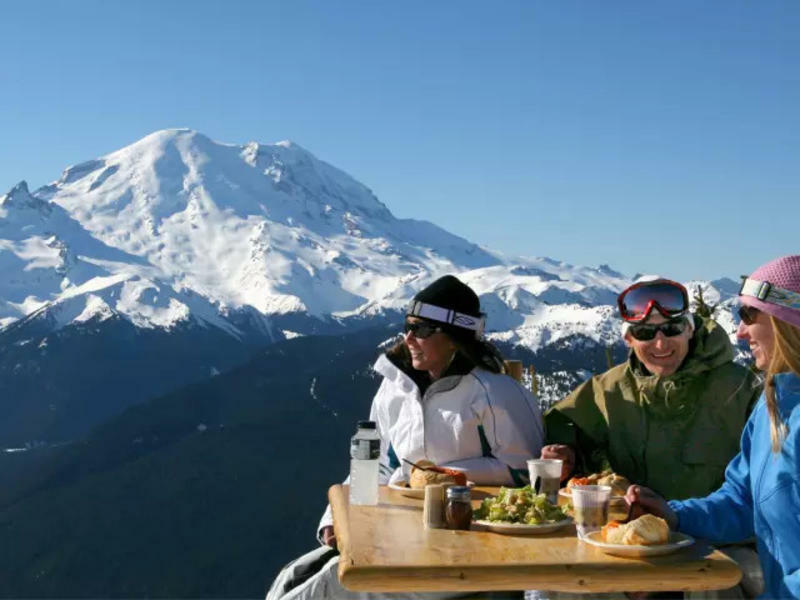 You can dine at the highest point in Washington state when you take the Crystal Mountain Gondola up to the Summit House Restaurant. You will not get a better view of Mount Rainier without having to work for it. For a rustic feel and a slice of fantastic pie, stop by the Copper Creek Inn and Restaurant. Ashford is the last town before heading into Mount Rainier National Park from the Longmire entrance. So stock up on gear at Whittaker Mountaineering; or rent snow tires if they are required for ascending to paradise. 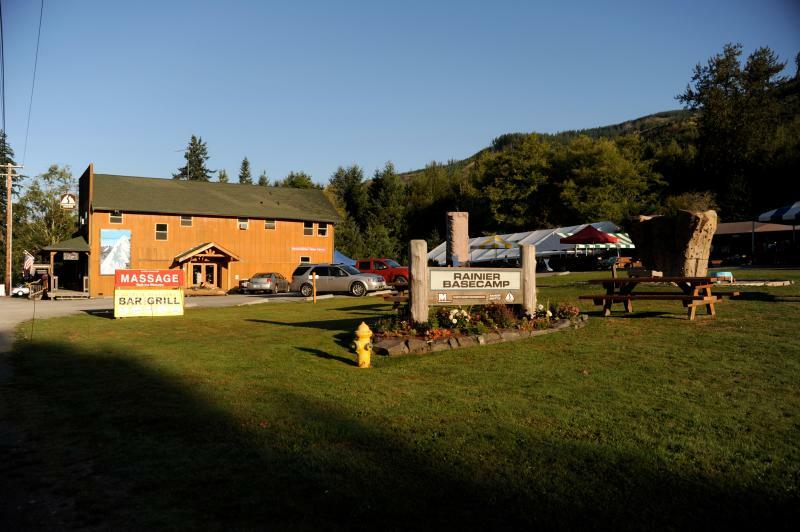 The surrounding Mount Rainier communities are also great places to pick up farm fresh foods. Stop by Left Foot Farms for eggs, cheese and a cuddle with a baby goat, or swing by Take Root Farms for raw honey and other seasonal delights.